Strawberry Moon rising over Chicagoland, Monday, June 4, 2012. Tonight is a Strawberry Moon on Friday, the 13th. In 2014 the Strawberry Moon occurs on Friday, June 13. The Cardinal image photographed on Monday, June 4, 2012 is showing up as the second image in Google image search results when users search strawberry moon photo, and is showing up as the third image in Google image search results for strawberry moon. The Strawberry Moon appears in Late Spring (June). The Strawberry Moon is also known as the Flower Moon, the Honey Moon, Rose Moon, Hot Moon, Planting Moon. The Hindu name is Wat Poornima. The Sinhala name (Sri Lanka) is Poson. In 2012, Chicago missed the partial eclipse of the Moon because of clouds before sunrise and during moonset the day before, but Monday night’s moonrise was spectacular. There was a tint of strawberry. 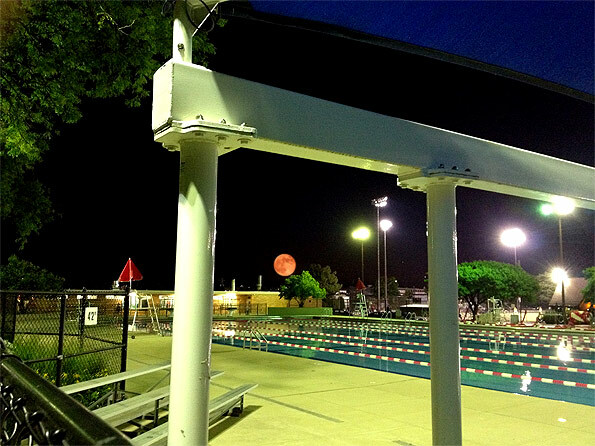 Full Moon rising over Recreation Park pool (Photoshop composite). Recreation Park pool staff were in awe of the Full Moon rising over the east end of the swimming pool Monday night as they prepared to close for the night in 2012.